A little Serbian Salad for ya. 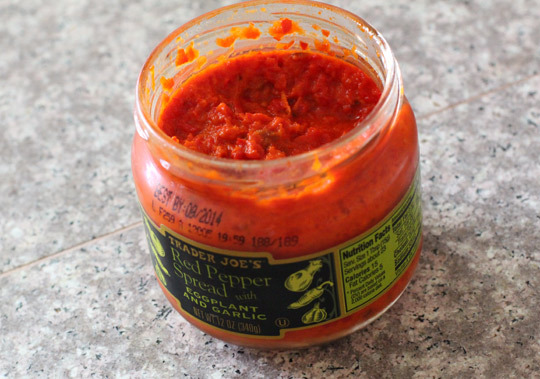 It seems like there must be something wrong with Trader Joe’s Red Pepper Spread with Eggplant and Garlic. For one, that is a ponderous descriptor for something which has an actual name. Two, and more importantly, it’s bitter – so unpleasantly bitter! “Add to pasta sauces, spread on chicken,” the jar enthusiastically suggests, “Top a burger with it!” Why, jar? I like all those things. Why would I want to smear a bitter condiment from the former Soviet bloc all over them? That is being, perhaps, a bit unfair to the good people of Bulgaria, from whence this spread hails, and who I’m sure are only trying to do the best they can. The problem may lay in me, after all. Red Pepper Spread – or ajvar as it’s known as in its Serbian homeland – is not something I’m very familiar with. I’m more than willing to grant that the the subtleties of the spread are being lost on me. Let’s take a quick look at the history of this unusual spread before we get into what exactly it’s trying to do to your taste buds. Ajvar, also known under the more easily remembered but more frightening sounding name “Serbian Salad”, is basically a type of relish – made primarily from roasted red bell pepper and garlic, containing various quantities of eggplant, red pepper etc. Historically, the dish is known as a winter food throughout the Balkans, canned in early Autumn and subsisted on until spring brings fresh veggies. I’m not quite sure why Trader Joe’s embraces some of the cultural names for its dishes, like dukkah, but not others, like this poor spread, unless perhaps they feared the outrage of countless babushkas, their dudgeon raised high by a sub-standard product peddled under the name ajvar. All else set aside, I must praise Trader Joe’s for fetching interesting foods from interesting places. Always a culinary adventure at TJ’s! Of course, every adventure must have its times of misfortune, and that is where our red pepper spread comes in. In its homeland, this spread can be many things – piquant, red hot, even sweet – what it is not supposed to be, and what most foods try and avoid being, is unpleasantly bitter. As the spread hits the tongue it is nearly sweet, thanks to the sugar added by TJ’s to offset the harshness of the taste. Even with the sugar, however, the bitterness comes through, clean and strong, right from the beginning. During the chew the bitterness rises in power, finally lording over your tongue for the length of the aftertaste. I can’t really figure out what it is they put in the spread that makes it so bitter – the list of ingredients is pure and simple, veggies, some oil and vinegar, no preservatives or artificial colors. It’s possible the fault lay in the preparation process itself. Ajvar is rumored to be best when roasted – not simply cooked on an industrial scale. Perhaps what the spread is missing is the tender loving of a roasting flame? What isn’t bitter in the spread is certainly worth praising. The robust, earthy tastes of the eggplant and red pepper very nicely compliment simple meat and vegetable dishes, but the bitterness is simply too strong for me to actually enjoy any given mouthful of the stuff. It’s a nice idea for a spread, I only hope Trader Joe’s can reformulate this and bring it back under a prouder banner. Would Recommend It: I’m afraid not, not even for novelties sake. Would I Buy It Again: This spread has no place in my cabinet. Final Synopsis: A hearty, tasty spread ruined by a strong bitter flavor. Interesting post, since I don’t find it bitter at all. In fact, it’s one of my must-haves for cooking and snacking. It’s delicious mixed with sour cream. I also loved it. It was sweet with a kick. Are you crazy? Just kidding, but i LOVE this stuff and so does every i know thats tried it. I do admit i wasnt too impressed the first time” but mant things are sorta “aquired” tastes. a bitter condiment from the former Soviet bloc??? you don’t know what you are talking about. Surely we can agree that individual tastes differ. I’m just crazy about this, but you are free to not like it. By the way, “you don’t know what you are talking about”! 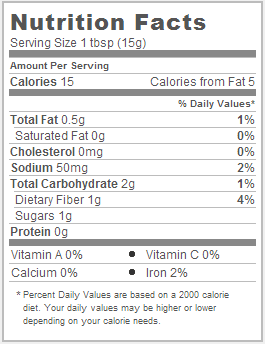 I just sampled this today at TJ’s and LOVED it! I was just googling it because I am already tryig to recreate my own version of it at home! I found it quite sweet and not bitter at all…. Not bitter from where I sit. Sweet is more like it. I decided to google this item looking to discover why I needed to throw it out 5 days after opening.